Puro is a coffee brand owned by Belgian company Miko, set up in 2005 to focus on ethically and environmentally responsible coffee. 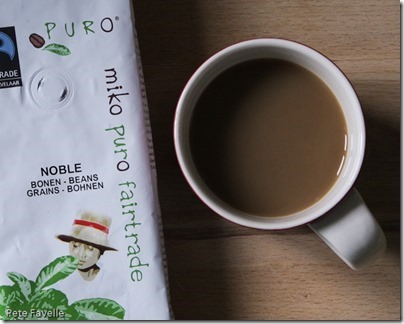 Not only are all their products Fairtrade (why isn’t all premium coffee?) but they also work with the excellent World Land Trust, donating two per cent of money generated from sales – and in doing so have helped to protect over 8500 acres of rainforest so far. Although you may not recognise the name, Puro supply quite a range of chains in the UK including the likes of the National Trust and Wyevales, and their own web store is “coming soon”. This is their Noble coffee. Perhaps unusually for a premium coffee, it’s a blend which includes 20% Robusta beans – a bean often considered (not always fairly) to be the poor cousin to Arabica. The grounds have a fruity aroma of redcurrants and sweet citrus along with a hint of caramelised sugar and just a suggestion of milk chocolate. Brewed, the fruit and sugariness is still present but the chocolate notes have been replaced with something more nutty. The sweetness doesn’t really come through in the taste, but there’s a nice roundedness to it; medium bodied without being rich along with a bitter edge that doesn’t become unpleasant. The fruit lurks underneath, becoming darker – more blackcurrant than red now. It’s not spectacular, but it’s a very easy going, satisfying, every day coffee which earns 2.5 stars. Many thanks to the folks at Puro for sending me this coffee to try. Arabica being better is definitely pure marketing nonsense. In the past robusta was cheaper because it is grown at lower altitudes, more resistant to disease and more accessible and thus marketeers labelled it inferior to arabica. These days robusta is often just as much per kg or more in some instances than arabica. Did you try out the organic one from Puro, that is the one that I am familiar with and a fan of.